It was a tale of two seasons for Chris Archer in 2011. After being sent to the Rays in a trade that sent 2008 ALCS MVP Matt Garza to the Cubs, Archer struggled out of the gate. His first-half ERA sat at 5.27, a number that would be high for any pitcher, but especially so for one who started the season on MLB.com's Top 50 Prospects List. 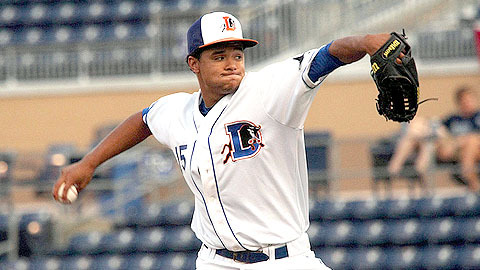 Something clicked for Archer in the second half, and he showed the form that made him a Southern League All-Star in 2010. The 23-year-old right-hander went 5-4 with a 3.45 ERA in 11 starts for Montgomery and earned a late-season promotion to Triple-A Durham, where he allowed just one run while fanning 12 batters in 13 innings over two starts. MiLB.com: What was the biggest difference in the second half for you? Chris Archer: At the beginning of the season, I think I was trying to do too much and got out of character. I was trying to make too many perfect pitches instead of letting my stuff just play in the strike zone. I was trying to make perfect pitches like a back-door slider and when you try to become too fine in this game you make little misses. I just said, "I'll go back to being myself." MiLB.com After being drafted by Cleveland in 2006, Tampa Bay was your third organization in four seasons. Does that bother you? Archer: It doesn't bother me at all, especially because the guys I've been traded for have been top-notch guys. It's always a little bittersweet but sweet that another team wants to trade for you. MiLB.com After enduring a rough first half, how gratifying was it to turn things around and reach Triple-A? Archer: It was awesome. My main goal wasn't to finish the season in Durham -- obviously I wanted to get a September callup -- but the way I started I could not have had a better finish. Since I'm from the Raleigh, North Carolina, area, I was able to come home and pitch a few times in front of my family, which was awesome. MiLB.com During the season you developed a friendship with Matt Moore, how did that come about? Did you guys talk about his recent contact extension? Archer: We talk a few times a week about different things. We built a relationship that expands outside of just baseball. There's a few situations that we've been through in life outside of the baseball diamond that we converse about, and we definitely stay in touch during the offseason. He told me a little about it before -- he didn't give me too many details. Whatever he told me about I said, "You're one of the top pitchers in baseball, and you definitely deserve it." Matt's the kind of guy who definitely deserves what he got, and hopefully he'll be in Tampa for a long time. MiLB.com Do you have any kind of ritual you go through before taking the mound? Archer: I stick with a routine, I don't have any rituals because you know something gets thrown off, and you have to make up for it in another way. I don't eat anything specific, but I try to keep my same routine and whatever city I'm in and adapt accordingly. MiLB.com What are your favorite things to do on a day off? Archer: Days off in season -- just relax, chill, read a little. You get a good chance to call your buddies back home and catch up with them. You get to the ballpark around 2 or 3. You don't get out until 10 or 11, and they're usually asleep, so that's a good time to catch up with friends and family. MiLB.com What was the last book you read? Archer: The last book I read was Failing Forward by John Maxwell. I read it a few years ago and, after the season, I thought it would be a good book to read. It shows that you can still go through ups and downs but stay consistent. I wanted to refresh the things I read and apply it to this past season and go into the upcoming season. MiLB.com Ending the season at Triple-A puts you right on the cusp of getting to the big leagues. What is the key for you entering 2012? Archer: Staying consistent and getting better. Obviously, I finished well last year, but there are things I can do to get better. Continue to grow as a pitcher, get experience and stay consistent, and hopefully I can contribute to the team in Tampa this year. MiLB.com What would you be doing if you weren't playing baseball? Archer: I would say I would probably be in college or just finishing up. I don't know anything definite because I focus my attention on baseball, I don't do what-if games. If something happened that I couldn't play baseball, I'd address it then. Probably something to help people. Whenever it comes to helping the community, I'm all about it. I try to do things here in my hometown to help people out, and right now it's baseball. Whatever craft or trade I do, it wouldn't be a selfish thing, I don't know what it would be, but it would be geared towards helping others. MiLB.com In the past, you've talked about your mentor. How did that relationship come about and how does it benefit you? Archer: [Ron Walker] actually coached the junior varsity baseball team when I was a freshman in high school. He was the first person outside of my parents to instill the fact that I was good and that I had potential. From there, he went from coach to helping me work out. Then we got close -- I looked at him like a brother figure, and then it led him to being my mentor. I see him every day when I'm at home, but the biggest aspect he helps me with is the mental aspect of life. He played baseball when he was younger, but the way he helps me the most is with life experience. I use him as a mental coach more so than a baseball coach, but he still helps me with some baseball things and some lifting. But I would say our relationship is more like brother/mentor. MiLB.com What's your favorite park to play in as a visitor? Archer: Whenever I went back and played at Tennessee [in 2011], it was kind of a unique situation. It was early in the season, they were playing all the highlights from the season before, and I noticed that I was in a few of them. Going back and seeing the fans, the coaches and players that I played with last year was cool. Tennessee is one of my favorite parks to play at, and going back as the opposition made it that more interesting. MiLB.com: What player did you grow idolizing? Archer: When I was really young, it was Ken Griffey Jr. when he was with Seattle. When I got a little older, I really liked Torii Hunter. When I got to high school, I really liked Mariano Rivera's demeanor on the mound. As I got older and knew that I was going to be a pitcher, I really focused on Mariano Rivera's demeanor and how he approaches the game. MiLB.com: What was the last movie you saw? Archer: Mission Impossible 4, the newest one (Ghost Protocol). It was pretty good, good action, exciting scenes, and the technology they use is pretty cool. I enjoy catching a movie now and then, but it's pretty tough during the season.